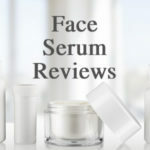 You are here: Home / Face Serum 101 / What Do Face Serums Actually Do? Face serums are gloriously-positioned by the big skincare companies as the end-all, be-all of young skin. Skin experts, celebrities, social media starlets, beauty bloggers and beyond all swear by the tangible, youth-inducing benefits of facial serum. If you’re like the rest of us, you see the sudden intrigue with a new product and it’s hard not to get trigger happy with your online shopping cart. But do you know what face serums actually do? 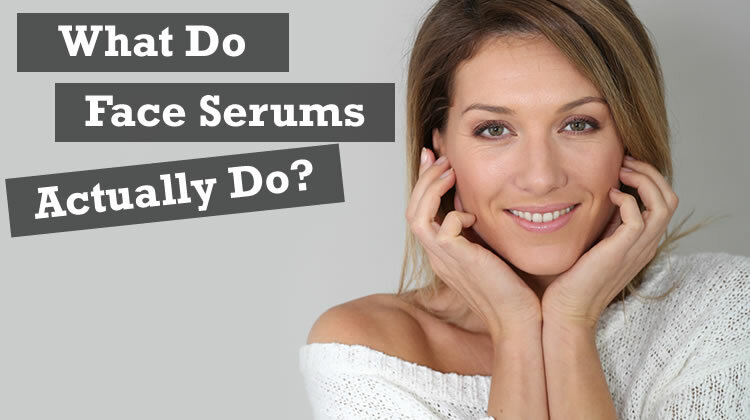 Or what a serum even is to begin with? Even the word itself, “serum” sounds mysterious! Sometimes we use things (with the best intentions) and have no earthly idea what they are, how they work, or what they actually do. Well, you’re not alone if you’re hesitant on what the heck face serum is. You might have a general idea, it’s good for your face, it’s got a weird name, it’s all the rage, and it seems luxurious (especially given some of the price tags). But let’s break it all down so we can get to the bottom of all this serum talk. And you’ll be a face serum expert in no time. To start off, we first need to know what in the world face serum is. Serums have a knack for being relatively contradicting. They’re moisturizing, but not a moisturizer. Watery, but not an essence. Oily, but not a face oil. Face serums are lightweight, fast-absorbing solutions that are highly concentrated with specialized active ingredients for flawless skin. They have distinguishing textures that are usually gel-like, silky liquid fluid, soft delicate lotion, or a liquid-gel hybrid. With these particular consistencies, facial serum typically comes in an airtight pump bottle or a bottle with a medicine-dropper applicator. You’re also not going to see facial serums come in Costco sized amounts. They come in very small bottles and tubes. This may seem disheartening, but no need to worry. The beauty of these beauty solutions is that just a few fluid ounces can last you quite a while. 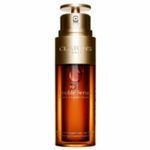 It’s because face serums are loaded with potent, super concentrated ingredients. All you need is a few pumps or drops of serum to get a full face worth of benefits. 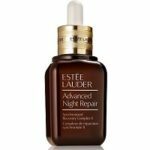 How Do Face Serums Work On The Skin? Face serums are extremely unique compared to other facial products. Often, these products all get lumped into the same category but there are distinct differences. Serums are rich in active ingredients and have minimal “fluff”. Facial serums exclude heavy ingredients like occlusives such as mineral oil and petroleum. They also have less thickening, lubricating, and moisturizing ingredients such as seed or nut oils. Many facial serums are water-based, liquid concentrates that omit oils entirely. So what you’re left with is a flawless face formula that’s chock full of anti-aging and beautifying ingredients. Face serums are comprised of particularly small molecules. These small molecules can penetrate deep into the skin, where they are absorbed quickly and easily. So facial serum packs a powerful punch in just a few concentrated drops. Serums differ from your typical moisturizer because, as we said earlier, they don’t contain those thick, heavy moisturizing and occlusive ingredients. Thick creams and lotions work by creating a physical barrier on the skin. That barrier prevents water from evaporating and helps lock in intense moisture. However, that barrier can also keep beneficial ingredients out. Without these additives, facial serum can freely absorb deeply into your skin and effectively deliver these crucial active ingredients. We learned what face serums are and how they work on the skin. Now it’s time to find out what’s in them that makes them actually work. So listen up ladies (and gentlemen), because we may have just found the modern day fountain of youth. Face serums are miniature vials of skincare magic that have the ability to completely transform your skin. They contain the most potent, hyper focused ingredients that kick your skin into high gear and get it looking its absolute best. Because of these high quality ingredients, serums can cost a little more than your average facial moisturizer or cream. But time and time again they prove to be one of the most important, if not the most important part of your beauty routine. Why? Because it literally makes all other products work better as well. Fortunately, a little goes a long way with serums, so you’re getting the most bang for your beauty buck. It also contains a much higher amount of active ingredients. Your average facial creams, cleansers, and moisturizers usually have around 5%-10%, whereas face serums contain up to a whopping 70% of active ingredients. These complexion-correcting components make face serums ideal for targeting a wide range of your specific skin concerns. Let’s see what face serums actually do and how they benefit the skin. Face serums are topping the charts because of what they’re actually able to do. Many beauty products promise the world and leave you empty handed. This isn’t the case with face serums. They greatly benefit and nourish the skin offering up incredible results, and quick! Smooth fine lines and wrinkles and tightens skin. Creates a firmer, smoother skin texture. Brightens and rejuvenates dull looking skin. Increases moisture levels for plumper, more hydrated skin (without leaving you greasy or shiny). Evens skin tone and treats hyper-pigmentation and discoloration problems such as brown spots. Treats acne and fights future breakouts. 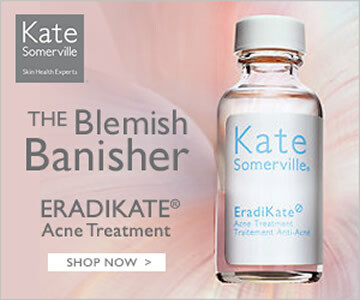 Reduces and fades acne scarring. Speeds skin cell turnover and collagen production. Exfoliates and gently dissolves away dead skin cells. Acts as an anti-inflammatory and calms puffy, red skin. Reduces the size and appearance of pores. All of these characteristics lead to more youthful, glowing skin. Face serum corrects your current complexion issues and reverses the major signs of aging. They work hard so you don’t have to. You end up spending less time covering up and more time showing off that flawless face. Face serums are undoubtedly popular in the beauty scene and they’re now being deemed a must have in your daily skincare regime. When your skin’s foundation is healthy and nurtured, it makes everything else a piece of cake. Face serums might just be that missing link to perfect, radiant skin. So, we just covered quite a bit of information about face serums. Let’s go over the main points one last time. Face serums are specialized facial solutions that deliver powerful ingredients right into the skin. They are formulated with only the most essential nutrients and leave out anything that weighs it down (literally). Smaller particles allow serums to seep deep into the skin, where it can go to work. Serums are made up of the most active ingredients including antioxidants, peptides, vitamins, hydrators, stem cells, botanicals, growth cells and more. It’s truly quality over quantity and a few drops daily are all it takes to start seeing major skin results. Face serums target and treat your major concerns such as wrinkles, aging, discoloration, scars, acne, and dull, dehydrated skin. These serums are one of the quickest and easiest ways to get that youthful glow you’ve always wanted. Need Help Choosing The Perfect Face Serum? All this important information has soaked in, right? It’s now apparent that a face serum is your new secret weapon to achieving perfect skin. There are literally hundreds of different face serums out there and more are being added each day. All of them claim to be the best and it’s confusing and time consuming. We did the work for you and compiled a list of the best face serums on the market today. 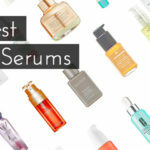 If you need help finding the perfect face serum for you, check out our comprehensive list of the 10 best face serums currently available!